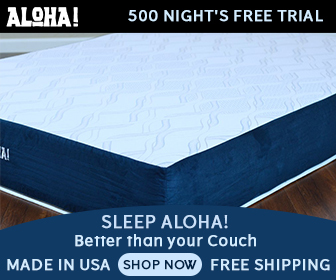 The aloha sleep mattress twin size plus 2 free pillows starting price $599 only. Honoring those who serve. Use code "ALOHALIFE" for $50 off at checkout. The Aloha lifestyle is one of living stress-free, easy-going and comfort. Aloha Sleep aims to bring a little Aloha lifestyle to the world through the Aloha Sleep mattress and Aloha Sleep experience. The Aloha Sleep mattress is the USA made mattress, made with certified non-toxic materials so you can rest and sleep Aloha. The Aloha Sleep mattress features unique Aloha Cooling Fabric, designed to keep you refreshed like those afternoon Hawaiian breezes of the coast of Waikiki. The Aloha Sleep mattress features Cool Sleeping Gel Foam layers to help alleviate pressure and a strong, supportive base material to keep your back in alignment. These features mean you will sleep cool, comfortably. Found a coupon for Aloha Sleep?